Pictures, images and photos of Rhodes city on the Island of Rhodes (Rodos) , Greece. 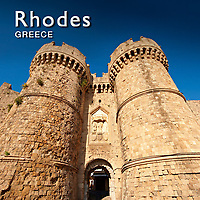 Rhodes is an ancient settlement of the Dodecanese islands and has been settled since pre history. Today the medieval city is dominated by the Palace of the Grand Master whose medieval battlements look more like a town in northern Europe than in Greece. This was built by the Knights Hospitallers who founded a hospital in Jerusalem in 1023 to care for sick and injured pilgrims to the Holy Land. After the First Crusade in 1099 the order became a religious military order and following the fall of the Holy Land to the Muslim forces in the 13th century the Knights Hospitalers set up their headquarters in Rhodes. After the Knights Templar were dissolved in 1312 the Hospitallers were given their property and the holdings in Rhodes were organised into Priories of eight languages one each in Crown of Aragon, Auvergne, Castile, England, France, Germany, Italy, and Provence. Each of these was organised under a Grand Prior who inturn were under the Grand Master. As well as caring for the sick and as military knights The Hospitallers acted as a banking system for merchants from the west. After the fall of Constantinople in 1453 Sultan Mehmed II made the knights a priority target. It wasn't until 1522 though that a force of 200,00 men under Suleiman the Magnificent forced the 7,000 men at arms of the Hospitalers to abandon Rhodes and retreat to Sicily. The medieval city of Rhodes is today a UNESCO World Heritage Site and under the Italian rule of Mussolini the Palace of the Grand Master was renovated as a retreat for himself and King Victor Emmanuel. The city has a Jewish quarter with a memorial to the Jews that lived there and died under fascist repression. There is also a Turkish quarter with mosques and the old shops of the Bazaar selling tourist trinkets.